Cargolux Airlines has welcomed its 11th Boeing 747-8 freighter from Boeing. The latest addition to the airline‟s growing 747-8F fleet is registered LX-VCJ and named „City of Zhengzhou‟ in honor of Cargolux‟s partnership with its Chinese shareholder HNCA and its recently established Chinese hub in Zhengzhou. “Our new „City of Zhengzhou‟ will help us to strengthen our services between Luxembourg and the province of Henan,” says Dirk Reich, Cargolux President & CEO. 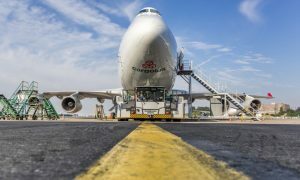 “In addition to the economic, operational and environmental advantages that the aircraft brings, we can also boost our traffic and revenues in cooperation with our Chinese partners, while customers benefit from the efficient and fast services we can offer.” Cargolux plans to increase its 747-8F flights between Luxembourg and Zhengzhou to multiple daily connections. With its 11th 747-8F in service, Cargolux operates the most modern freighter fleet in Western Europe and one of the youngest fleets worldwide with an average age of 5.6 years. Cargolux was the launch customer and first operator of the Boeing 747-8F. The company has another 3 aircraft on order and also operates 11 747-400 freighters.